Gone are the days you simply unfriend an ex on Facebook. This Valentine’s Day, there's a new way to get sweet social revenge on your ex. The Bronx Zoo in New York is offering still-not-over-it singles the chance to name a cockroach after their exes. The original idea had so many legs (get it?) 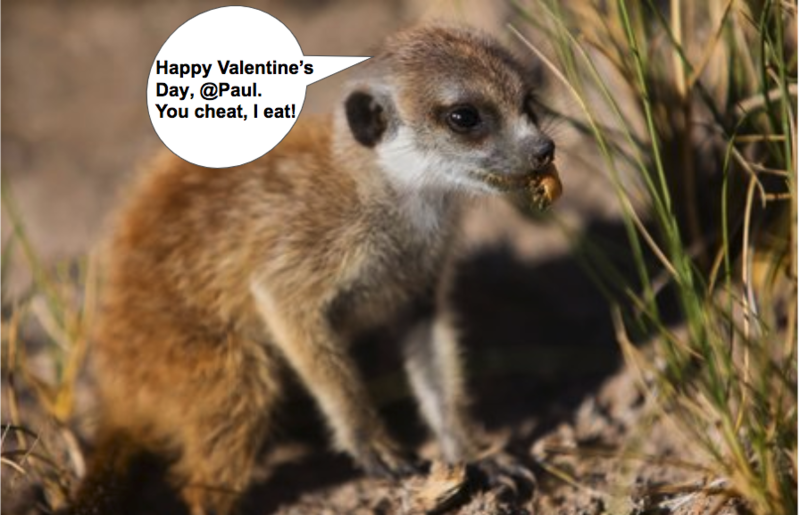 that the El Paso Zoo in Texas upped the ante - they’ll name the roach after your regrettable ex then feed it to a meerkat live on camera on Valentine's Day. In a campaign cleverly dubbed "Quit Bugging Me!!!" the Zoo says the roach is a perfect Valentine's gift for those needing closure on a past relationship that didn't make the grade. All you need to do is message the zoo your ex's name on Facebook, and starting 11th February, their first name and last initial will be displayed on both social media and outside the meerkat exhibit. 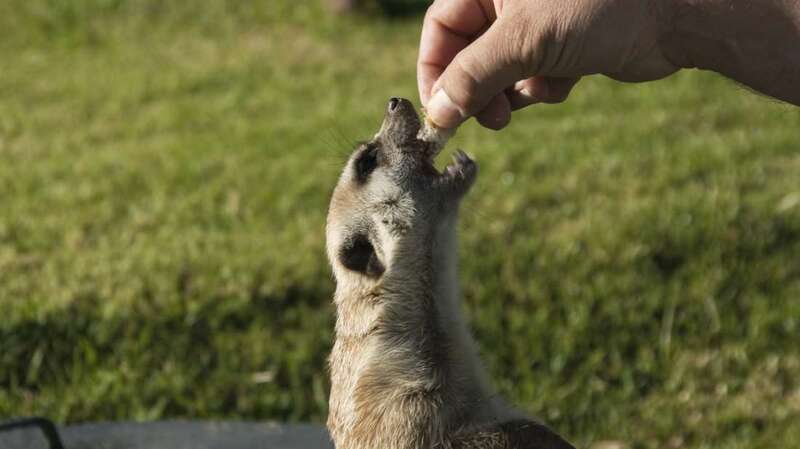 Then on 14th February, the unlucky bugs will be fed to the zoo's meerkats as part of their daily enrichment activities. This could also be a fun summer activity for bored and bitter Australians looking to make use of unwanted household critters. Do you despise anyone enough to give this a go? Tweet us @wearesocialau, or seek counselling. In less bizarre news, Facebook is letting brands and publishers in on its Groups action. Group activity around shared interests is increasingly a core focus for the company but, before now, company involvement has been via personal accounts of people in a business, or by Pages starting their own Group. Facebook's new tools allow brand Pages (a cool 90 million of them) to join and participate in private Groups when granted access. The move has been neatly justified by Facebook with this statement: "When we talk about Groups, we are talking about community," says Alex Himel, VP of business products at Facebook. "In the real world, businesses are part of the community." Apparently Facebook was also busy shopping for shopping technology, as it's been announced that the company has acquired visual shopping and artificial intelligence startup GrokStyle Inc. in a move to bolster the platform's own AI work. GrokStyle’s technology, which has famously been integrated into Ikea’s mobile app, requires a user to take a picture of a piece of furniture then let the technology match it to similar products that could be purchased online. It is thought Facebook could use the purchase to bolster their future AI efforts, and it could be a useful integration into Facebook Marketplace. We interrupt this extensive string of Facebook updates to bring you some #Grammy's gossip. 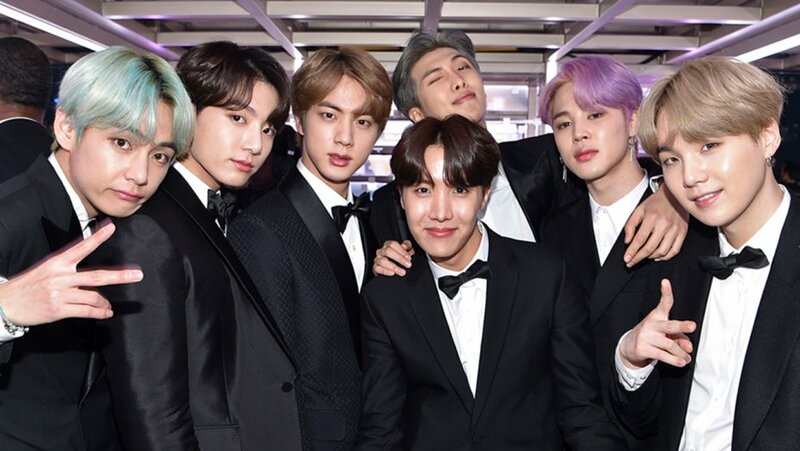 Despite not winning any awards, BTS stole the show at the 61st Grammy Awards ceremony and, consequently, won over social media. The happenin' K-pop group presented best R&B album to H.E.R., which was the most-tweeted-about moment of the night. Drake accidentally scored the second-most-tweeted-about occasion when he accepted the Best Rap Song award for "God's Plan" - a moment that didn't exactly go according to God or anyone else's plans. During his acceptance speech, the rap god who once coined the term #YOLO was abruptly cut off by the show's producers. While he was heard saying "but..." before the broadcast cut to a commercial break, the producers later said that Drake "took a natural pause in his speech," which led them to believe that he was done. Media buying friends - is it too late to make #DrakeBreaks a thing before commercials? Let me know. Lastly, drama's firstborn child, Cardi B, kept the conversation buzzing well after the show wrapped. While we're happy to report she made history for her victory in the Best Rap Album category - an award never before given to a solo female rapper - she's now extended the Grammy's buzz by her antics on - you guessed it - social media. In defence of her history-making hardware, Ms. B. posted some angry, expletive-filled rant on Instagram, which she then deleted before deleting her whole account, but not before the internet caught wave of her fury. Why did she feel the need to defend her win in the first place? Perhaps because other artists felt the award should have gone to recently-deceased Mac Miller, who was also up for the award. That camp also took to social to tweet-and-delete their outrage. More on it all here. Ok, now back to Facebook. You can now save yourself your own deletion drama with the power to unsend messages on Facebook Messenger. That's right, the platform has finally released the feature that they promised nearly a year ago. To use, simply tap on the offending message and select "remove". Even five pints down you should be able to manage that, right? However, it won't alleviate any regrettable messages sent Saturday night - you only have 10 minutes to change your mind. In case you've outgrown policing your own antics on Messenger, Facebook is shifting its focus to Messenger Kids, which launched in December 2017. The controversial app must be set up by parents, who maintain full control over it via a Messenger Kids control panel. It's designed to give kids under 13 access to basic Messenger features such as one-on-one, group, or video chats plus the sharing of photos and videos. Facebook said it's also closing several projects from its youth team, including the LOL app, which was in beta testing and High School Networks for Messenger. 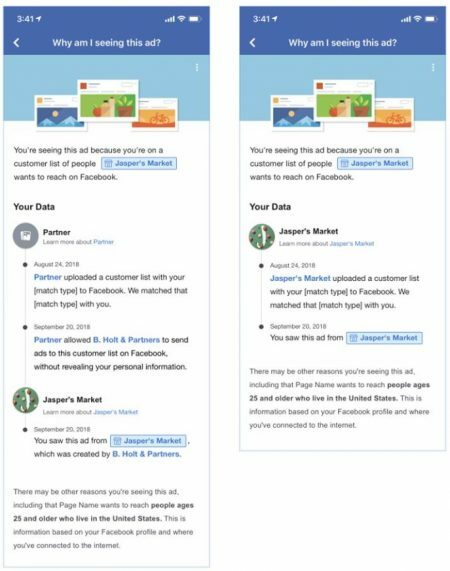 In its latest transparency move, Facebook will add more detailed explanations of ads for users, in cases when custom audiences built from customer files were used. From 27th February, The 'Why am I seeing this?' explanation will include the name of the business that uploaded the user’s information to Facebook. It will also cover any other sharing of custom audiences that may have taken place, plus involvement from agencies, Facebook Marketing Partners or other partners. 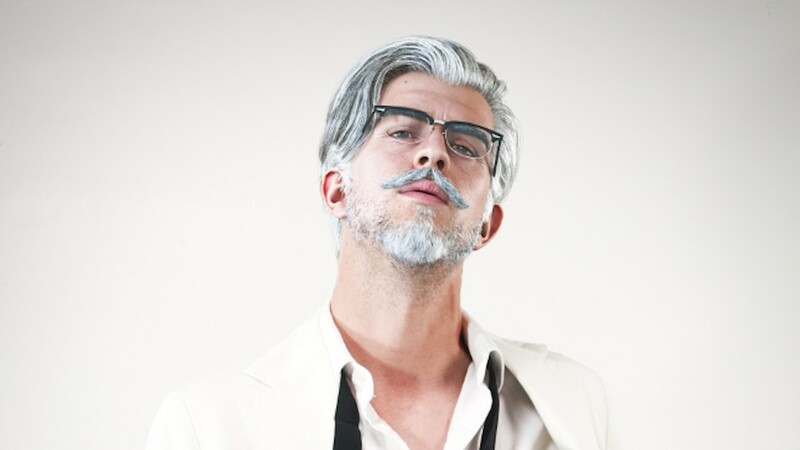 Will this impact your targeting plan? Tell us in the comments. Good news for wannabe Insta stalkers, as users of the platform are now unable to see viewer lists on their Stories after 24 hours. And people are furious, obviously. Apparently this feature is essential for checking if ex partners or potential love interests are keeping tabs on you, only now you have to be quick to look before the Story moves into the archive. Another solution is to feed your ex to a meerkat, guaranteeing they'll never view your Story again. Instagram Stories plans to add a donation sticker to allow monetary contributions directly through the app. Sorry influencers - it's not a new money-making tool - the sticker can only be used by registered nonprofit organisations. There will be no processing fee and the full amount of the donation will go towards the organisation using the sticker. And now, some numbers. Who's the biggest loser? Not Snapchat! Some decent Q4 results for the platform, with daily users staying flat at 186 million - no drops like Q1-Q3 last year. It also reached record revenue of $390 million, up 36% year-over-year and beating Wall Street's $378 million estimate. While the platform is still loss-making, it's getting better at losing less, according to CEO Evan Spiegel - “This limited our Q4 losses to just 13 percent of our revenue, compared to just one year ago when our Q4 losses totalled more than 50% of revenue”. Just imagine - in a couple of years it might even be profitable! Exciting stuff. On what has traditionally been a closely-guarded secret, Twitter has for the first time disclosed their number of daily active users. In the platform’s earnings report released last week, Twitter said it has 126 million daily active users, a figure that is dwarfed by Facebook's 1.2 billion daily users and still falls short of Snapchat's daily users by 60 million. While the new figure reveals Twitter's smaller community in comparison with rival platforms, the number of people using the site each day was up 9% (126m) from this time last year. However, the number of people using the site on a monthly basis fell from 326m in the previous quarter to 321 million in the last three months, with the platform's fake account cleansing cited as a major factor for this recent decline. The Patriots weren't the only victors at this year's otherwise uneventful Super Bowl. While the game score was dismally low, these newly-released Nielsen numbers show strong engagement from fans with brands on the night. So which brands were worthy of a touchdown dance? 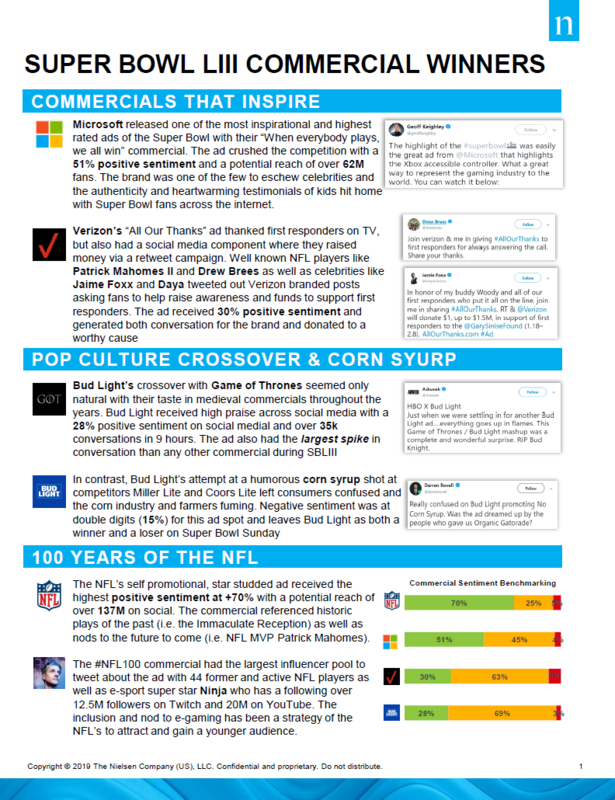 Telco sponsor Verizon's CSR campaign, Bud Light's GOT crossover and the football league itself won fans over on social with their big-budget TV buys, many of which had social components built in from the start. Note the impact of influencers and e-gaming in the #NFL100 ad campaign, areas the League has actively looked to play in to attract and retain younger fans. Reddit, the self-proclaimed front page of the internet, is reportedly looking to raise $150 million to $300 million in forthcoming Series D funding. Chinese tech giant Tencent is said to be the major player involved, and Reddit's post-money valuation could reach a mind-blowing $3 billion. Reddit continues to grow, with 330 million monthly active users on its 150,000 Subreddits. If you'd like to see a great example of how organisations could be using Reddit, check out our recent work on the platform here. Flamingo, Otter, Guide Dog and Slot are all on the final emoji list for 2019. It's now been approved by the Unicode Consortium - 230 new emojis will be coming to major platforms this year. Happy face.